Clear air in the kitchen! 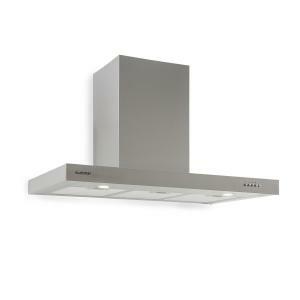 The Klarstein Zarah 90 cooker extractor hood provides clear air without vapours for medium to large cooking surfaces. For different cooking activities, it can be operated with three different power levels. At the highest stage it carries up to 600 m³ / h of exhaust air from the kitchen and also deals with the preparation of several courses. The Klarstein Zarah 90 is a wall-mounted hood that blends elegantly into any kitchen landscape with its timeless stainless steel design in the Bauhaus style. With a width of 90 cm, the T-shaped housing offers a practical storage space for spices at the same time. Ventilation levels and lighting are controlled via the front-side operating section. 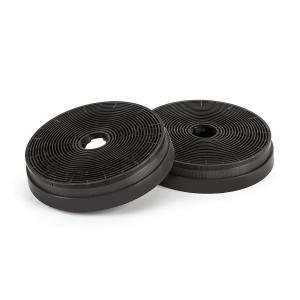 Three replaceable and dishwasher-suitable aluminium grease filters extract the grease from the intake air and thus protect the engine and exhaust air duct against contamination. The extractor hood is mounted on the wall above the hob. The brackets, check valve and a 1.8 m long and 15 cm diameter exhaust hose are included in the delivery of the hood. With the two-part stainless steel flue duct, the hood fits visually perfectly into modern kitchens. In dimly lit conditions, the switchable, dual-lamp LED lighting of the Klarstein Zarah 90 wall hood can be used in order to illuminate the cooking area underneath. The extractor hood can be converted to recirculation mode with the help of two activated carbon filters (article 10030727).